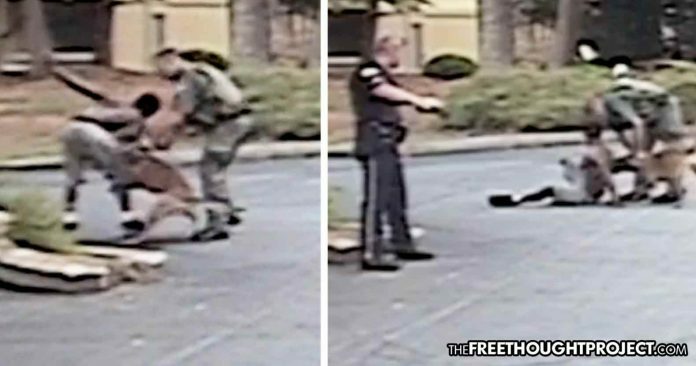 Disturbing footage has been released from an incident in which a police K9 ruthlessly attacked a teenage boy when he was following orders from officers. Two years ago, an unidentified teenager was a suspect in the theft of a stolen vehicle. The teen initially ran away after officers pulled the car over, but he came back after one officer said he would release the K9. From the dashcam footage that was finally released just this week, the officer can be heard promising to let loose his attack dog. I’m gonna send the dogs. I’m gonna send the dogs. Don’t run I’m gonna send the dogs. In all, more than 20 commands were given to the dog to cease the vicious biting. The dog did not stop and continued ripping the teen’s flesh, despite being choked by his handler. Incredibly, even after the officer got control of the dog, he was still unleashed to bite the boy’s hand. It troubles me that the K9 did not release sooner than he did…I would say, ideally, one command should be sufficient (enough to get the dog to release). “The officers that were on scene did everything that they were supposed to do,” Gran contended. Gran claims that there was a “failure of the leash”. Leash failures seem to be a convenient explanation when trained, killer, attack dogs get out of line. But that does not explain why the police report did not recommend additional training for the dog or even suggest that the dog should be decommissioned. The fact that the video, which is subjected to the Freedom of Information Act, was released a full two years after the incident, serves to illustrate that the police may have intended on keeping the unprovoked attack a secret. Not removing a police dog from duty after it repeatedly failed to respond to its handlers also demonstrates the scope of loose cannons the department appears to want to keep in its arsenal.